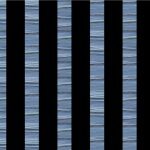 IICSI Postdoctoral Fellow, Teresa Connors’ exhibition Patterns opens Friday, April 26 at rOGUE Gallery in St. John’s Newfoundland! 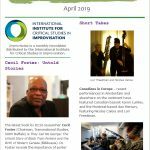 ImprovNotes Short Takes : Canadians in Europe, Pauline Oliveros: Still Listening in Kingston, Dædalus: Why Jazz Still Matters and the new journal Jazz Education in Research and Practice. 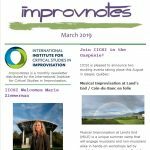 Short Takes news from the March 2019 edition of ImprovNotes, the IICSI’s monthly newsletter. 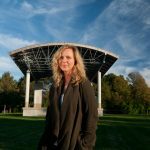 IICSI is proud to announce that Dr. Marie Zimmerman has joined the IICSI staff team in Guelph in the part-time role of Community Engagement Officer, Research and Partnerships. 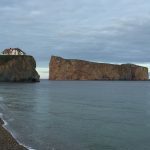 Join IICSI in the Gaspésie! 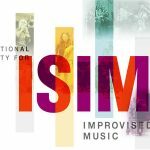 We are pleased to announce two exciting events taking place this August in Gaspé, Quebec: Musical Improvisation at Land’s End / Coin-du-Banc en folie and the Summer Institute for Critical Studies in Improvisation! 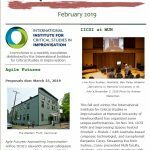 Short Takes news from the February 2019 edition of ImprovNotes, the IICSI’s monthly newsletter. 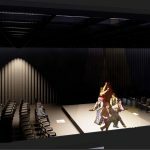 Renderings of the vision for the IICSI’s new ImprovLab, a research and performance facility at the University of Guelph by Diamond Schmitt Architects. 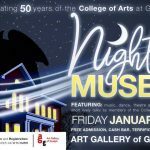 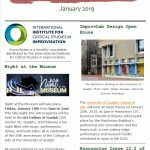 Inside the January 2019 edition of ImprovNotes: A Night at the Museum, CFPs, Issue 12.2 of Critical Studies in Improvisation, IICSI Postdoctoral Fellowships for 2019-2020, Maxine Gordon Authors Sophisticated Giant, Sound It Out, Short Takes and so much more!